Constructed from light weight and virtually indestructible Black Titanium. This wedding set includes two matching 7mm bands - one with a .16ct tension set diamond. Makes a great his and her matching wedding band set! The tension set ring takes about 2 - 4 weeks to make it in your size. These are our wedding rings, I liked that ring and saw it on another shop alone. My fiance wanted a matching band and we found it here in a bundle. I have had so many compliments about how lovely and unique our wedding bands are - my husband and I are a younger generation couple and were looking for something that wasn't run of the mill. 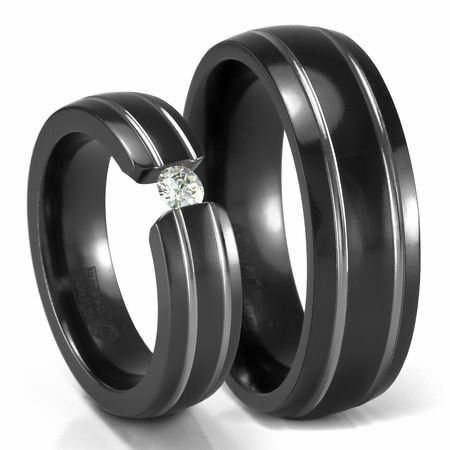 These "His & Her's Wedding Bands" are perfect. [...]We were more than happy with our purchase and look forward to our next. From browsing the site, making our order, [...] we are going to be recommending this site to others. This will be used as our wedding bands for our up coming wedding in July. 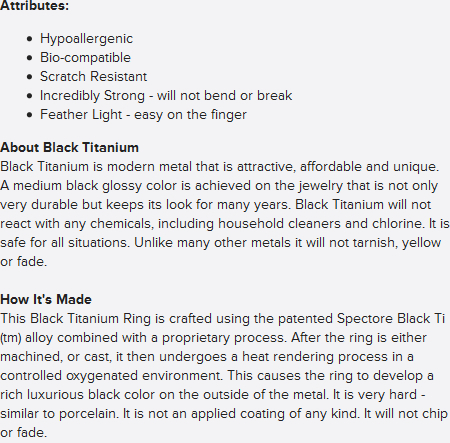 The look on my dad's face when I showed him, he was in awe to see the black titanium over the occasional gold and silver bands.